SUP is an acronym that stands for “standup paddleboarding” and it is taking the water sports world by storm. While it is difficult to measure the level of participation in outdoor sports, kayaking has long been considered the fastest growing water sport of the 1990s and early 2000s. It’s also safe to say that paddling kayaks has gone from the fastest growing to the most popular. Well, it looks like the sport of kayaking will have to relinquish at least one of those titles. Standup paddleboarding is quickly becoming the water sport of choice and while SUP might not be the most popular (yet) it certainly is the fastest growing. Standup paddle boarding has its roots where all board sports have their beginnings, in Hawaii. Known as Hoe he’e nalu, standup paddle surfing actually has ancient roots but became popular in modern times among surf instructors and photographers trying to get a higher vantage point than the surface of the water. Basically, SUP uses a surf style board and a long paddle. In that regard, it is a cross between canoeing and surfing. While originally made popular by surfer Laird Hamilton as he used the paddle to help him catch the towing waves found in Hawaii, SUP is not only for surfing any longer. 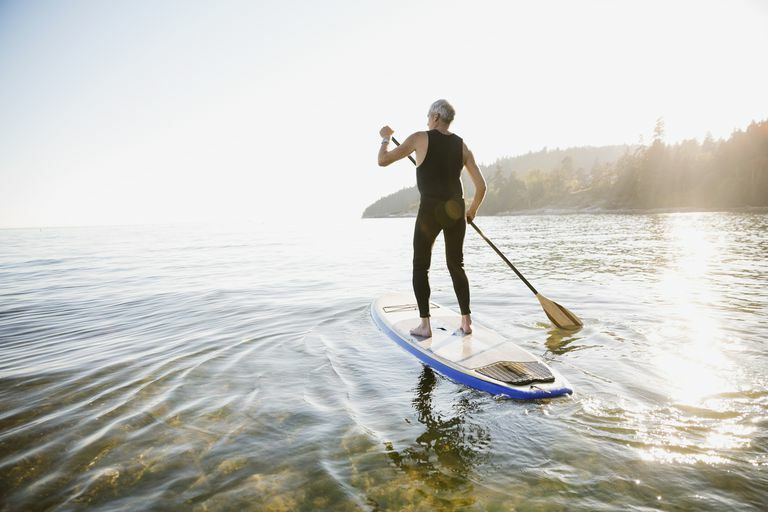 Standup paddling can be done in a variety of forms such as on flat water protected lakes to easy beach paddling, to open water paddling and all the way to surfing waves. While you can just go to a shop and buy the first or cheapest SUP they have, that isn’t necessarily the most effective way to get started in the sport. SUP boards and SUP paddles range in price, design, and materials. Obviously, the better quality SUP gear is also going to cost more money. However, the better made gear is often designed for intermediate and experienced paddlers. Here is what we recommend for beginners. First, anyone wishing to learn to standup paddleboard should go to their local SUP shop and take a lesson and rent gear a couple of times. Try out different boards and see what you like best. Many outfitters will apply rental costs toward the price of new equipment so be sure to ask about that. Also don’t be afraid to buy used equipment to start out. You can find great deals in the classified ads or many shops will have boards that have been traded in or were demos that they are willing to sell. What Is the Official SUP Sports Name? At any rate, if you see the word SUP or any of the above combinations, you know we’re talking about this relatively new sport that is taking our waterways by storm. In the end, it’s not how you say it but rather whether you do it that counts. Get out there and paddle board!